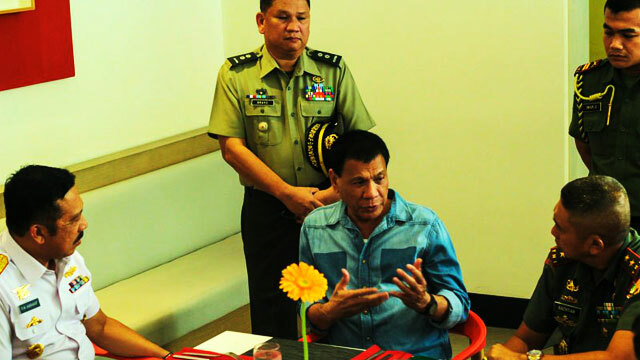 Election frontrunner Davao City Mayor Rodrigo Duterte will be appointing former members of the military and other key allies to Cabinet positions if he wins the presidency. "Do not be surprised if others are military people... I want military men. Most of them will occupy lower echelons," he told ABS-CBN. Duterte said he will also appoint his running mate, Senator Alan Peter Cayetano, who is currently at a far third in the vice presidential race, as his Foreign Affairs Secretary. Former Agriculture secretary Carlos Dominguez, who owns the Marco Polo Hotel in Davao City and managed the finances of Duterte's campaign, will be assigned as Finance Secretary. Duterte said his old friend and former classmate can also be appointed as the Secretary of the Department of Transportation and Communication. Meanwhile, he would tap the expertise of another one of his classmates, Jesus Dureza, whom he plans to appoint as a presidential peace adviser. Among his closest allies, Duterte said Peter Laviña, his spokesman, will retain his position and be based in Davao City, the Inquirer reported. His legal counsel Atty. Salvador Panelo will be his spokesman at the Malacañan Palace, while his campaign manager Leoncio Evasco will remain at his side although no specific position has been revealed. Duterte is currently leading the presidential race with over 15 million votes as of 12:30 p.m. with 91.16 percent of the total Election Returns being accounted for. He is trailed by administration bet Mar Roxas (9,249,813 votes) and Senator Grace Poe (8,589,807), both of whom have already conceded.